Its tricky trying to get all worked up over exotic plantings when the clouds are as thick and grey as an army blanket, and the temperature is hovering around 47F (8C). However I need to think ahead and plan some new plantings for my garden for this summer. In recent years I have done a small but lush and colourful planting, mainly of seasonal exotics - Ricinus, Cannas, Dahlias, Coleus, Brugmansia and so on. But this is a bit expensive when I have no greenhouse to overwinter the stock and besides its time for a change. 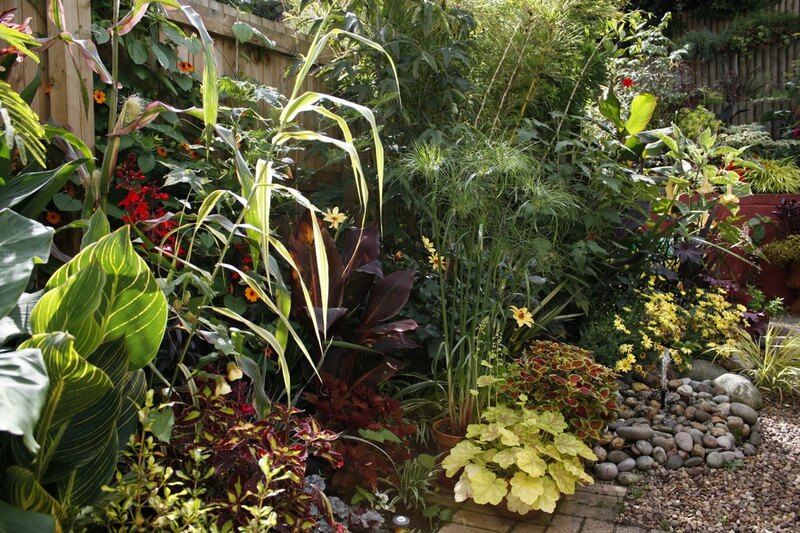 I like plants with attitude - good foliage, bold shapes and preferably bright colours. However I am wondering whether to go for greens and whites in one area this summer? The front garden also needs a makeover and with the impending hosepipe ban for the Midlands I am contemplating an arid scheme with some spikies and so on. What I do want is more permanence, although I guess I'll always want some seasonal plants each year! 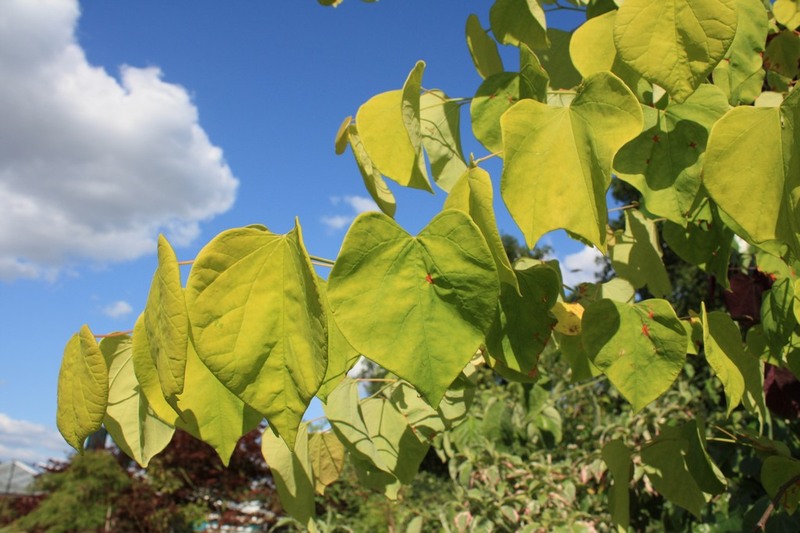 I have very little room for new trees in my garden but I would like to try the sunny looking Cercis canadensis 'Heart's of Gold'. If its anywhere near as good as its cousin, the purple leaved 'Forest Pansy' then it will be worth the space in a crowded garden. Fortunately the pink flowers are said to be produced before the leaves unfurl each spring. Pink and yellow just do not go together and don't try to tell me they do in a garden! 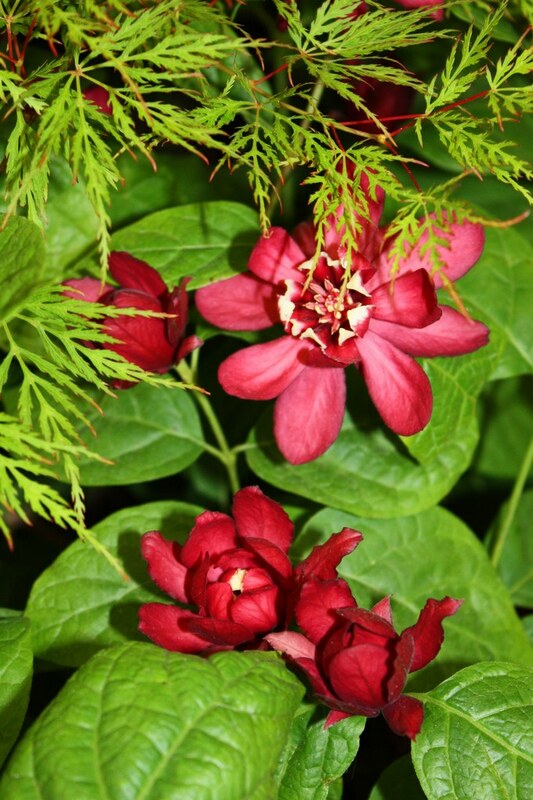 One new shrub I want to try is Sinocalycanthus 'Hartlage Wine' which is a hybrid between the Asian C. sinensis and the North American C. floridus. It is said to be a fast growing plant and certainly the deep red flowers are spectacular with a sweet fragrance. Hilliers have been exhibiting it at Chelsea for a few years but the Plant Finder sadly doesn't list any suppliers. At the last show, a rather exuberant salesman was telling me about its origin but my overstimulated Chelsea brain didn't absorb the information - sorry! Although not a new plant I do want to get the golden variegated form of Fatsia japonica called ' Annelise'. This is such a striking plant that I am surprised it is not more widely available. I did grow it at the University though and found it to be slow growing, so maybe its shy to produce at the nursery stage. Have any of you grown the new variegated Acanthus 'Whitewater'? It is described as having striking, deeply lobed and cut foliage that is heavily splashed with white. The pale pink flowers have almost red stems creating a stunning effect. Like most acanthus, its said to be fairly tolerant of soils but preferring a lean gravelly soil and not liking disturbance. there are four UK suppliers in the Plant Finder. 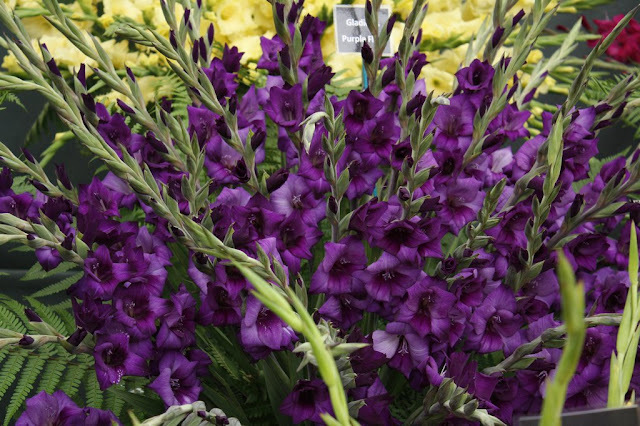 The last couple of years I have fallen in love with an opulent looking purple Gladiolus, exhibited at Chelsea by Pheasant Acre Plants and called 'Purple Flora'. (Sadly no website) But gladiolus are such stiff unrelenting plants - how can I use them in the garden? Ideas please! I have an increasing affection for Crocosmias and must try to source some good cultivars. Last summer I particularly coveted a cultivar called 'Carmin Brilliant' in Tim and Jenny's beautiful little exotic garden is West Bridgford. Its open under the National Garden Scheme later in the year and well worth a visit. Details of opening. 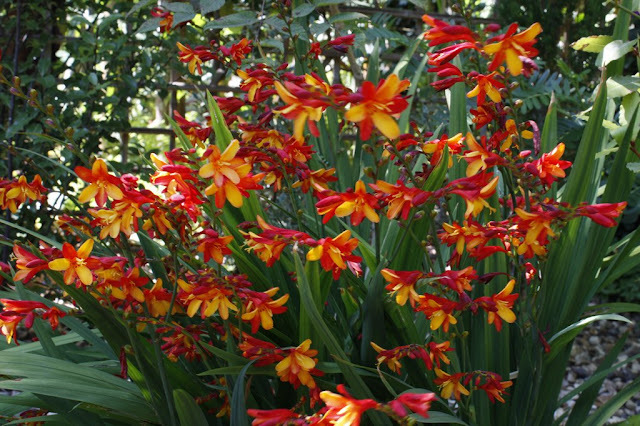 According to the Plant Finder, this crocosmia is widely available. 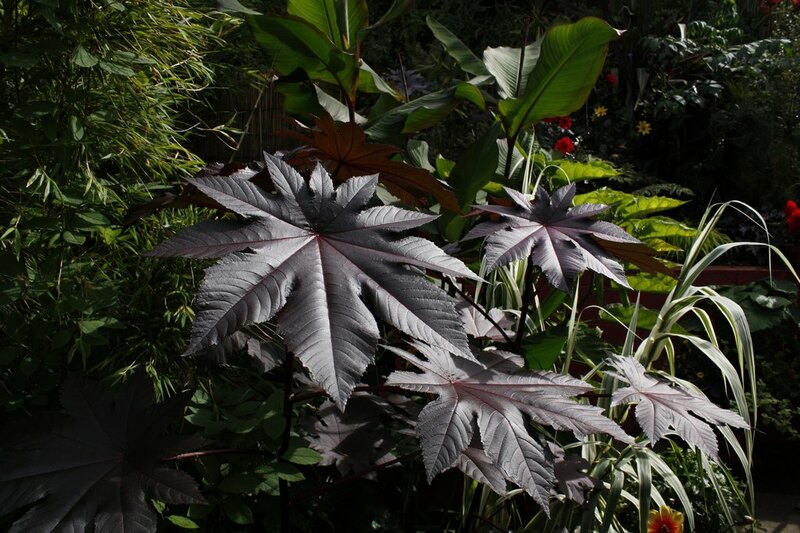 I have ordered a few seeds, amongst which is Ricinus 'New Zealand Purple' which is probably one of the fastest growing purple leaved plants available and undoubtedly the best castor oil plant. This is one of the annuals I MUST have. From seed sown in March it will make a 2m (6ft) tower of lush deep purple foliage with a wonderful metallic lustre. So exuberant! Reviewing this, it does seem a rather odd list, although there is a tree, two shrubs, an herbaceous perennial, two bulbs and an annual. 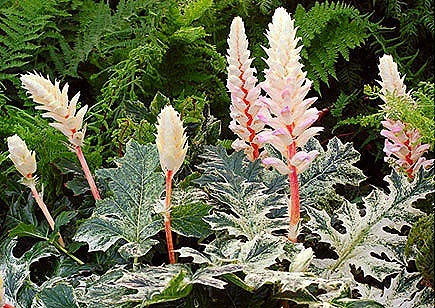 Apart from the sugary-looking acanthus, they could actually all be planted together in a small border. Anyone who has heard my talks on 'Designing Small Gardens' or read my recent book will know that I recommend keeping a 'Plants Want' list for times such as this. But do you really think I take my own advise? Never! I tend to be more of an impulse purchase gardener. I fall in love with plants, buy them and then decide how to fit them together. So maybe I'll add to this list when I've made a few nursery trips this spring and returned with a car full of new purchases ready for planting! Great blog Ian! We were out at a garden centre this morning and were considering getting Cercis canadensis 'Hearts of Gold', but didn't in the end. Your photo makes me think we made the wrong decision. Umm....that dark metallic Ricinus leaf sure would go well with the yellow Cercis! Ian, some nice choices there. If you find Fatsia japonica 'Annelise' for sale, then let me know! 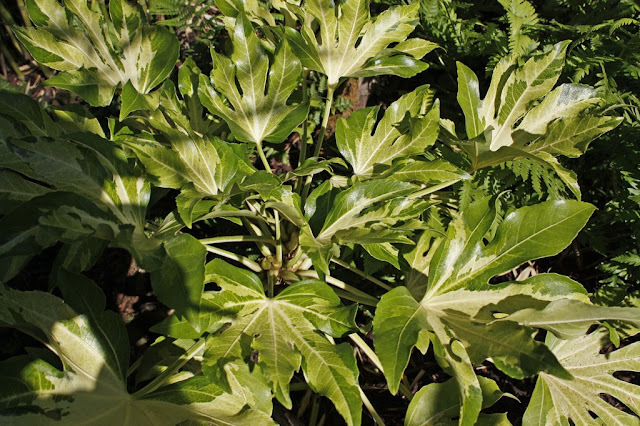 I guess if you can't track it down then the more commonly available Fatsia japonica 'variegata' could make a replacement? Acanthus 'Whitewater' looks intiguing too, and a new one on me. Those white spikes look really unusual (although I never quite trust the colours on promotional photos like that!). It reminds me of a white broomrape. I like it! Yes - promo pics are often distinctly photo-shopped!Not that I don't use that program myself! wow - you keep two gardens going? that is a big job! I just discovered your blog - I live over in tropical Australia so I guess all three gardens are pretty well spread out across the globe. Now that's a country I haven't visited - its so far away! If you are still looking for the Sinocalycanthus 'Hartledge Wine' we have some available at Timmermans Garden Centre, Woodborough. Not too far from you. Also have a very nice Cercis 'Hearts of Gold' in stock too. If you are interested let me know and I can put them on one side for you. Love the blog by the way.